Melodic, medium tempo instrumental blues song featuring guitar and organ. There is also a vocal version. It does not follow a strict blues format, but uses that as a base and adds changes that allow for nice melodic lines. The guitar solo builds to layers of harmonies reminiscent of Brian May; a somewhat unusual twist for blues. The basic song structure came together very quickly, in a day or so. Written last February, the title was initially just a temporary way for me to refer to the song. When I sat to write the lyrics, the working itle seemed to still be a good fit, and I worked towards that angle- the feelings of dark winter days, lonliness, and expectations of the approaching spring to boost the spirit. 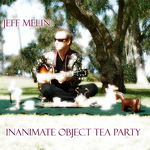 Thanks for supporting Jeff Melin! Would you like to help Jeff Melin get heard by industry pros by buying them a song submission credit to Broadjam Music Licensing Opportunities?